Go to the student's Financial > Dashboard view. 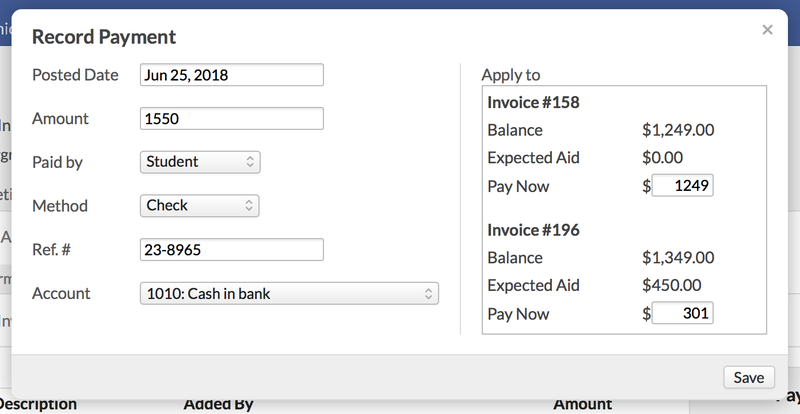 Enter the posted date and the amount. Select who made the payment. If you select other person or organization, start typing a name and select from the results that come up. If the person or organization doesn't already exist, you'll get the option to add them as a new person/org. Select the method and enter an optional reference number. If you have enabled online payments and choose Credit or ACH/e-Check, you should use the online payment page to process the payment (rather than merely record it here). Select the asset account you want this payment to debit. What invoices will this payment apply to? Unpaid invoices show the balance, the amount of aid that applies to it (expected aid), and how the payment amount (pay now) will apply to the balance. If you need to change the pay now amounts, just type in a different amount. Click Save to finish recording the payment. These payments are given the Customer Payment transaction type. To record a refund, have a look at refunding credit balances.